The Lord’s Supper: Our Synod L.C.C. (Lutheran Church Canada) and our sister church L.C.M.S. in the U.S.A. practice “Close” communion. We require all participants of Holy Communion to be instructed on how to receive this Blessed Sacrament. If you would like to receive this instruction, please contact one of our pastors or elders. Women to Women: Listen to Phyllis Wallace on “Woman to Woman” on CHAM radio 820 CHAM at 10:30 am on Sunday. Offering Envelopes: If you require additional envelopes – please advise Susan Boldt - sbboldt@gmail.com or phone 905-623-8588. 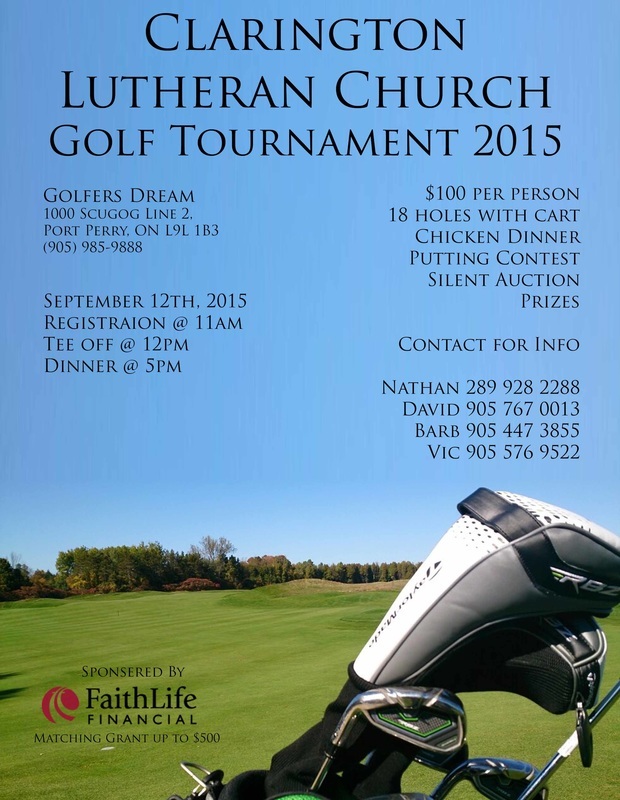 Golf Tournament – September 12, 2015 - see poster on back table. Pastor Mel – Be aware that the Elders are concerned and in touch with Pastor Mel about his ongoing health issues and how they relate to our congregation. For the next while we will be relying upon the support of our other Pastors to lead the worship services at Clarington. Please continue to pray for our Pastor, as he needs our prayers. Tristen Erding, Marilyn Burns, Henry Ritskes, Tom Borden and Marilyn Robinson. Deloris Ross, Shelley and Cameron Ross. Stewardship Last Week, Aug 2, 2015. And without faith, it is impossible to please God, because anyone who comes to him must believe that he exists and that he rewards those who earnestly seek him. ALL BLESSING GROUPS HAVE BEEN DISCONTINUED UNTIL SEPTEMBER. Bowmanville Blessing Group: discontinued until September. Contact: Kevin Dunsmoor – 905-623-9298. Oshawa South Blessing Group: discontinued until September. Oshawa Senior’s Blessing Group: discontinued until September. Courtice Young Adults Blessing Group: Wednesdays at 7:30 pm at the home of David & Lynn Moulds, 108 Glenabbey, Courtice. For more information, contact Daniel Cunningham @ 289-316-1036 or Pastor Mel @ 905-259-5420. Toronto Youth Adult Blessing Group: at the home of Alex Anagnostakos, 35 Mariner Terrace Suite 205, Toronto, Ont. Call Alex at 905-244-5198. Lindsay Blessing Group discontinued until September. Contact Allan Robinson 905-626-3445. Pickering Blessing Group Wednesdays - 7:30 pm. at the home of Chandra Wilson, 1525 Deifenbaker Court, Pickering, Apt. 401, Buzz 060. Courses that introduce the basic teachings of Christianity, from a Lutheran perspective, are being formed on a continuous basis. If you are interested or know of someone who is, please contact one of the Pastors, or one of the elders, for a meeting time and place. Just wanted to post a map. Here is where our church is located. Please join us.